Ngurah Rai International Airport, also known as Denpasar International Airport (DPS), is in fact directly North of Jimbaran, about 10-15 minutes by taxi. Metered taxis (taksi berargo) are ubiquitous on the streets of Kuta and are a relatively cheap and reliable way to get around, especially at night. Avoid any taxi where the driver refuses to put the meter on. Jimbaran is only 10-15 min south of the airport A pre-paid airport taxi costs Rp 60,000-80,000 depending on exactly where in Jimbaran you are heading. Virtually all Jimbaran hotels offer a free airport pick-up service, however make sure that you request this when making a booking. 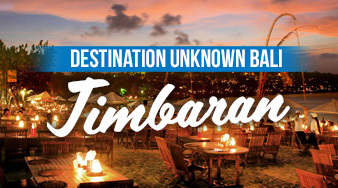 Jimbaran is around a 20 min drive from Legian and Seminyak, and 20 mins from Sanur, via the new toll road linking Benoa to the airport and Sanur. Bemos serving Jimbaran are almost non-existent but there is a sporadic service from Tegal terminal in Denpasar (via Kuta). This service continues on to Nusa Dua. There is now the Trans Sarabagita buses which run regularly and have stops right the way along the bypass and up through the University Campuas and beyond to Uluwatu. Balibelly.com’s Bingin Surf Cam provides surfers with a real-time visual reading of conditions on the south-west coast of Bali. Every 10 minutes the camera takes a tour from Padang Padang – Impossibles – Bingin – Dreamland. Shopping in Jimbaran has improved greatly in recent years. There are a number of nice boutiques and antique shops in the stretch of Jalan Uluwatu between The Intercontinental and the junction with Jalan Uluwatu II.